A complex weather pattern over the northeastern United States will only yield a brief period of light rain for the Finger Lakes. The weather this weekend will be interesting to watch, with dual, intense storm systems passing nearby. However, the Finger Lakes will be sandwiched between these systems with surprisingly tame results. 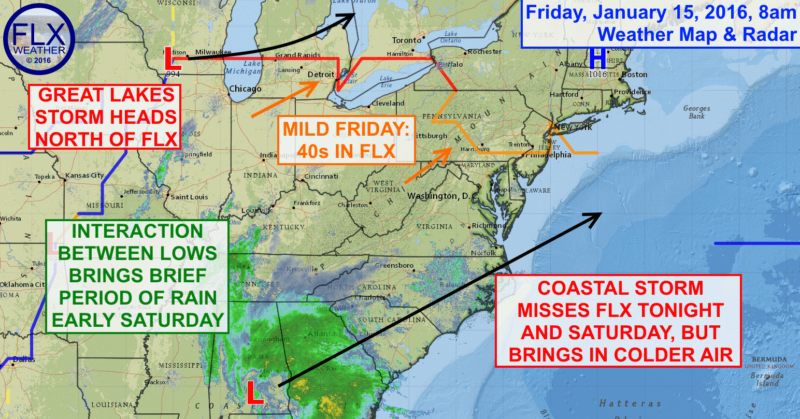 The first system is moving into the Great Lakes Friday morning, while the second is already starting to strengthen significantly over the Southeast. As the Great Lakes system moves northeast into Michigan, a warm front will slide through the Finger Lakes on Friday. With southwest winds throughout the day, temperatures should be able to reach well into the 40s. Any sunshine that can come out could boost temperatures even higher, but most places should reach the mid 40s for highs on Friday. The radar by Friday evening should show precipitation from the Great Lakes system to our west, and a large area of precipitation from the coastal low across the Mid-Atlantic and into southern New England. The Finger Lakes, caught in between the two storms, will be dry. Early Saturday morning, between roughly 3-9am, a connection will develop between the two storm systems. A small band of light rain will develop along this connection and bring some showers to the Finger Lakes during this time. This will be the only precipitation we see from either system as they race off to the northeast. The southwestern half of the Finger Lakes may not see any rain after dawn on Saturday, while the northeastern half should quickly dry out by mid-morning. Colder air will start to work back into the region as the coastal low becomes the dominate system. Highs on Saturday will be in the mid to upper 30s. Some limited lake snows will develop east of Lake Erie Saturday night into Sunday. An inch or two could fall across parts of the Finger Lakes favored by a Lake Erie snow band, but the greater snow concern will be Sunday evening or Sunday night. A third system will swing towards the Finger Lakes from the northwest sometime later Sunday. Temperatures will be falling and the dynamics look favorable for squally weather similar to what we had this past Tuesday. The timing of the squalls will be important, but remains uncertain at this point. Best case scenario is for squalls in the middle of the night, when their impact will be minimized. Worst case would be a later arrival towards Monday morning, which could make for a sloppy commute. Arctic air will follow this clipper system for the first half of next week. Lake snows are likely with significant accumulations expected. The location of these lake snows will also have to be worked out over the coming days, but this looks like a northwest flow event, which could mean some heavy snow for northeastern half of the Finger Lakes. Ithaca, Auburn, Syracuse and the surrounding areas should continue to monitor the forecast. Lake effect snow should taper off towards the middle of next week as high pressure and moderating temperatures move in. We are driving to georgia starting out on thursday morning, do you think we will be out in front of the storm ?